bunny☆kaisui's blog: Mary Angel's new single "Mousou Shoujo Mary"!! 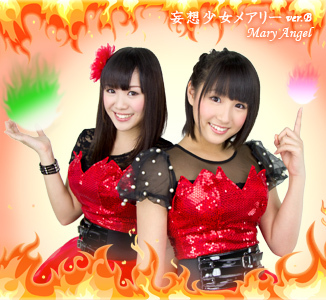 Mary Angel's new single "Mousou Shoujo Mary"!! Mary Angel are releasing a new single on January 16th! "Mousou Shoujo Mary (妄想少女メアリー)" is going to be their 6th single, 2nd one as a duo. Single contains 3 new unreleased tracks, the a-side being a song that already has been performed live many times! "Mousou Shoujou Mary" mantains Mary Angel's characteristic Eurobeat style while b-sides "ME CHA FIRE!" and "Tenshi na Koakuma (天使な小悪魔)" are more the happy/"genki" type of songs. Single comes in three editions, same content but different covers. Preorder your copy as soon as possible! !